Motivated by its mission to deliver a better life within the reach of all Malaysians, BSN dares to be better, pushing its limits to extend services to all Malaysians. BSN endeavours to give all Malaysians an equal opportunity to pursue a better and more promising financial future, and be their gateway to better lives. To achieve this, the bank leverages its expertise and experience of financial inclusiveness, supported by a comprehensive product and service range delivered through multiple touch points in all areas of the country. Founded in 1974, BSN currently has more than 7,000 employees, 401 branches, 872 Automated Teller Machines (ATMs), 372 Cash Deposit Machines (CDM) and more than 6,000 Registered Banking Agents (Ejen Bank BSN) or EB BSN across the country. 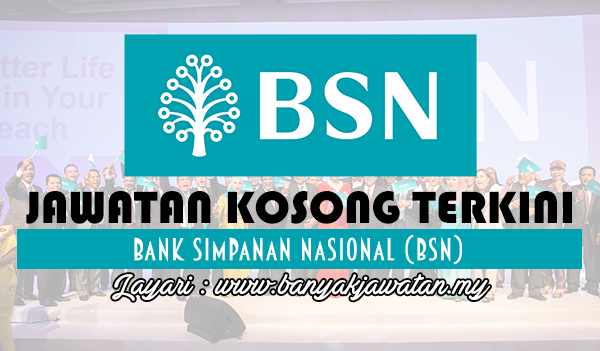 BSN has over 9.1 million customers across Malaysia with retail deposits amounting to RM14.7 billion. (As of July 2015). BSN offers a range of savings, wealth management, business and personal financing and card products both in conventional and Islamic banking. 0 Response to "Jawatan Kosong di Bank Simpanan Nasional (BSN) - 19 Ogos 2018"